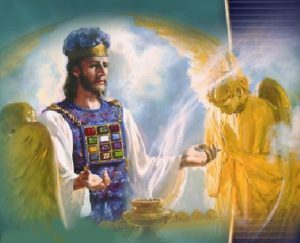 “God called Abraham to be a teacher of His Word, He chose him to be the father of a great nation, because He saw that Abraham would instruct his children and his household in the principles of God’s law. And that which gave power to Abraham’s teaching was the influence of his own life. The whole burnt-offering had its origin at the gate of the garden of Eden. 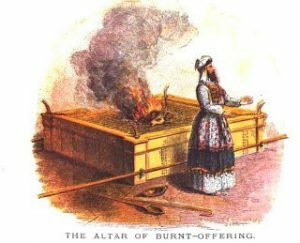 The entire sacrifice was laid upon the altar and burned. Every morning and evening a lamb was offered at the sanctuary as a whole burnt offering. If ever there was a time when every house should be a house of prayer, it is now. Infidelity and skepticism prevail. Iniquity abounds. Corruption flows in the vital currents of the soul, and rebellion against God breaks out in the life. Enslaved by sin, the moral powers are under the tyranny of Satan. The soul is made the sport of his temptations; and unless some mighty arm is stretched out to rescue him, man goes where the archrebel leads the way. And yet, in this time of fearful peril, some who profess to be Christians have no family worship. They do not honor God in the home; they do not teach their children to love and fear Him. Many have separated themselves so far from Him that they feel under condemnation in approaching Him. They cannot “come boldly unto the throne of grace,” “lifting up holy hands, without wrath and doubting.” Hebrews 4:16; 1 Timothy 2:8. They have not a living connection with God. Theirs is a form of godliness without the power. The idea that prayer is not essential is one of Satan’s most successful devices to ruin souls. Prayer is communion with God, the Fountain of wisdom, the Source of strength, and peace, and happiness. I know of nothing that causes me so great sadness as a prayerless home. I do not feel safe in such a house for a single night; and were it not for the hope of helping the parents to realize their necessity and their sad neglect, I would not remain. The children show the result of this neglect, for the fear of God is not before them. In many cases the morning and evening worship is little more than a mere form, a dull, monotonous repetition of set phrases in which the spirit of gratitude or the sense of need finds no expression. The Lord accepts not such service. But the petitions of a humble heart and contrite spirit He will not despise. The opening of our hearts to our heavenly Father, the acknowledgment of our entire dependence, the expression of our wants, the homage of grateful love –this is true prayer. 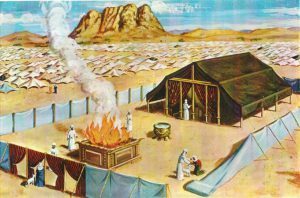 Like the patriarchs of old, those who profess to love God should erect an altar to the Lord wherever they pitch their tent. . . . Fathers and mothers should often lift up their hearts to God in humble supplication for themselves and their children. Let the father, as priest of the household, lay upon the altar of God the morning and evening sacrifice, while the wife and children unite in prayer and praise. In such a household Jesus will love to tarry. Let the members of every family bear in mind that they are closely allied to heaven. The Lord has a special interest in the families of His children here below. Angels offer the smoke of the fragrant incense for the praying saints. Then in every family let prayer ascend to heaven both in the morning and at the cool sunset hour, in our behalf presenting before God the Saviour’s merits. Morning and evening the heavenly universe take notice of every praying household. 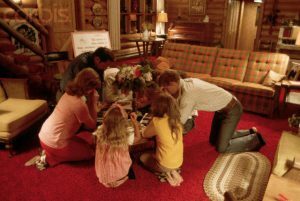 Before leaving the house for labor, all the family should be called together; and the father, or the mother in the father’s absence, should plead fervently with God to keep them through the day. Come in humility, with a heart full of tenderness, and with a sense of the temptations and dangers before yourselves and your children; by faith bind them upon the altar, entreating for them the care of the Lord. Ministering angels will guard children who are thus dedicated to God. In the morning the Christian’s first thoughts should be upon God. Worldly labor and self-interest should be secondary. Children should be taught to respect and reverence the hour of prayer. . . . It is the duty of Christian parents, morning and evening, by earnest prayer and persevering faith, to make a hedge about their children. They should patiently instruct them–kindly and untiringly teach them how to live in order to please God. In every family there should be a fixed time for morning and evening worship. How appropriate it is for parents to gather their children about them before the fast is broken, to thank the heavenly Father for His protection during the night, and to ask Him for His help and guidance and watch care during the day! How fitting, also, when evening comes, for parents and children to gather once more before Him and thank Him for the blessings of the day that is past! “As a part of religious service singing is as much an act of worship as is prayer. Indeed, many a song is prayer. If the child is taught to realize this, he will think more of the meaning of the words he sings and will be more susceptible to their power. Instrumental and Vocal.–Evening and morning join with your children in God’s worship, reading His Word and singing His praise. Teach them to repeat God’s law. Concerning the commandments the Israelites were instructed: “Thou shalt teach them diligently unto thy children, and shalt talk of them when thou sittest in thine house, and when thou walkest by the way, and when thou liest down, and when thou risest up.” Accordingly Moses directed the Israelites to set the words of the law to music. While the older children played on instruments, the younger ones marched, singing in concert the song of God’s commandments. In later years they retained in their minds the words of the law which they learned during childhood. “Satan makes every effort to lead people away from God; and he is successful in his purpose when the religious life is drowned in business cares, when he can so absorb their minds in business that they will not take time to read their Bibles, to pray in secret, and to keep the offering of praise and thanksgiving burning on the altar of sacrifice morning and evening. And love fills every breast.